(MoneyWatch) You might remember Incredimail for its array of cutesy stationary that your mom relied on to send you email, but the new Incredimail app for the iPad is a whole different beast: It manages to reinvent the look, feel, and operation of email for the 21st century. 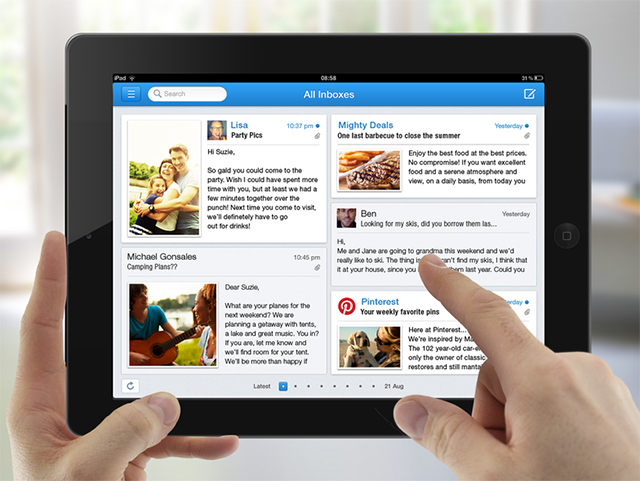 Incredimail for the iPad is nothing short of revolutionary, and represents the kind of innovative thinking that Apple should have applied to its own native iPad email app. Instead of delivering mail in a list format like you're used to seeing in every mail client since Vax, the program arranges mail in a visually attractive grid that resembles a modern iPad magazine layout. You can scroll through a message to read it in its preview box, or tap it to see the message full screen. Incredimail taps into Facebook to display profile pictures of your contacts when it can, and the app makes great use of the iPad's real estate by displaying images attached to the message inline. Even better, links are shown inline with previews, so you can see where the link will take you before you tap. You can connect multiple accounts and view your mail on a per-account basis or all-up, in a unified inbox. Unfortunately, while Incredimail is an IMAP-friendly app, it doesn't work with Exchange, meaning it's not a complete replacement for the iPad's native email app for corporate users. And that's quite a disappointment, because once you start to use Incredimail, going back to any other mail app will feel like a step into the previous century. One other cool feature: You can connect to Facebook and see a custom Photo Inbox, which shows you just the photos posted by your Facebook friends, with the ability to like and share images. It's a whole new way to interact with Facebook, and one that is sure to grow on you. Incredimail is free, and represents the most interesting development in email I've seen in a long time. If only it supported Exchange mail, I'd be ecstatic.